The goal of the PANTS meetings is to provide an opportunity for number theorists in South Carolina, and more generally, in the Southeast, to hear about recent research in all areas of number theory, pure and applied. For links to past PANTS meetings, visit the PANTS home page. Registered participants are listed here. Email address, and web-site (if available). Whether you are requesting support. If you are requesting support, please fill out the form here and submit it with your receipts (either at the conference or shortly after). You MUST contact Jeremy Rouse on or before August 30 if you are requesting support and are not a U.S. citizen or permanent resident to indicate your immigration/visa status. The registration fee for all participants is paid for by the NSA. We are grateful for the support of NSF grant DMS-1201126 which allows us to provide limited funding for travel and lodging. The conference talks will occur in room 016, in the basement of Manchester Hall (building 20a on the campus map). No permit is needed to park on campus, provided you park in a General parking lot (see the campus parking map). The parking office has specifically recommended lots Q and W1. The schedule is posted here. Abstracts can be found on pages 3-7 of the file linked above. The conference will start at 9 am on Saturday morning, and conclude at 3:10 pm on Sunday afternoon. 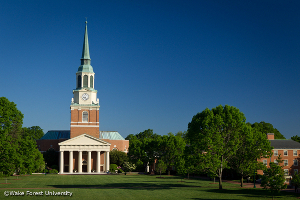 Wake Forest University is located in Winston-Salem, North Carolina. The closest major airport is the Piedmont Triad International Airport (GSO, about 30 miles east of Wake Forest University). (Note that Wake Forest University is not located in Wake Forest, NC.) Other (more distant) major airports are located in Charlotte, NC (CLT, about 90 miles southwest of WFU) and Raleigh, NC (RDU, about 100 miles east). The Clarion Sundance Plaza is about 1.2 miles from the math department and has offered us a special rate of 89.99 per night for the conference weekend. (This rate includes a free breakfast.) To make your reservation at this hotel, call (336) 723-2911 and mention you are part of the "PANTS 18 math conference". Courtyard Marriott, 1.2 miles from WFU. The Residence Inn, 1.7 miles from WFU. The Comfort Inn, 4.3 miles from WFU. The Quality Inn, close to the Comfort Inn. The Holiday Inn, close to the Comfort Inn. The Pit (officially called The Fresh Food Company). Located in Reynolda Hall (building 5 on the campus map) right next to the math department. The Benson Food court. Located on the first floor of the Benson University Center (building 6 on the campus map), you can find Moe's Southwest Grill, Chick-Fil-A, Take Two, and Forest Greens. These are open for lunch and dinner. Shorty's is full-service restaurant right next to the Benson Food court. It is open for lunch and dinner. Simplyummy Cafe is located in Reynolda village, about a 3/4 mile walk from the math department. It serves coffee, pastries, breakfast and lunch. The Village Tavern is a fine restaurant located in Reynolda village that serves lunch and dinner. We thank the Wake Forest Mathematics Department for providing the funding for the coffee that will be served during the coffee breaks. In addition, the Z. Smith Reynolds library (building 7 on the campus map) contains a Starbucks that is open from 10 am until 7 pm on Saturdays, and also on Sunday afternoon (starting at 1 pm). Another option is Simplyyummy Cafe mentioned above, which is open from 8 am until 3 pm on Saturdays, but is about 1 mile from the math department at Wake Forest.